For today’s Big Idea, Na’amen Gobert Tilahun looked at how people like him are imagined to be, and for his novel The Root, how to make positive the qualities that are often perceived by others to be negatives. A lot of the plot ideas in The Root are actually smaller ideas that become bigger and more expansive in the second and third books of the trilogy. Some deal with family or religion or betrayal or all three. I was struggling to decide which to talk about when I realized that with most of them it would difficult if not impossible to avoid spoilers. So I thought back to the ideas that got me writing The Root in the first place, the two ideas I thought were small and the idea that joined them together. 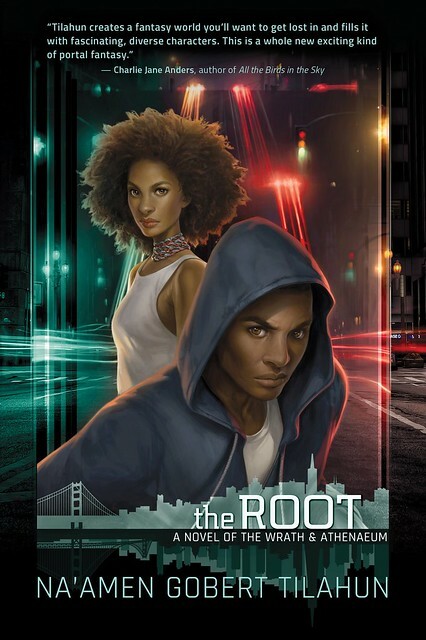 In The Root many of the characters get a few scenes from their point of view, but the two main characters are definitely Errikos Sabastian Allan and Lilliana Blackthorn Johns, or Erik and Lil for short. Both of them started as a bare sketch, a broad idea for a character in response to something. I’ve been a large black man all of my life and I’ve experienced the fear and suspicion that comes along with that. I’ve had people clutch their bags at the sight of me, tell me seats were taken when they were later given away, even cross the street to get away from me. These are just a few of the assumptions of anger and violence that I experience every single day. One day I thought: What if I wrote a black man whose power came from his anger? What if that angry black man was one of the heroes of the story? What if that angry black man was shown to be so much more than his anger? What if he was allowed to be smart and noble and vulnerable and all the things a hero should be? What would that character look like? For me, it turned out to look like Erik. Writing him proved difficult because we have so much of the experience of a black man in America in common,, but in other aspects we are completely different. I often found myself having to go back and correct the story so that he would act in a way that was about what Erik would do in that situation, not what I would do. I hadn’t anticipated this problem but I should have, because not only was I crafting a character similar to me but also the kind of character I wanted to see more of as a reader. I also had to resist the urge to make him the perfect hero, because I had been so in need of characters like this. I wanted him to be everything to everyone which is impossible. I had to remember I didn’t want an idealized protagonist, I wanted a real one who was nuanced and could allow people to see him as a fully human person, deserving of all the respect that entails. I’ve never been a black woman but I have spent most of my life around them as mothers, sisters, friends and cousins, as family who I loved and cared for and an intrinsic part of my community. I’ve also seen them called loud, obnoxious, ugly, stupid and far darker things. Black woman are not respected by our society at all, I’ve watched what we say they are in our media, how we erase them from history, how we ignore the things they contribute to society. And I thought: What if the black woman’s very power lay in her voice? What if you could not silence her no matter what? What if by voice I didn’t just focus on physical voice but also on the way she walked in the world, the things she thought were right, and would not be silent about? What if what she wanted more than anything was the truth? What would she do for it? And so Lil was born. Writing Lil was challenging for different reasons than Erik. Unlike Erik, when the book opens she still has some bit of innocence left, she clings to her belief in certain people. I knew the first book was going to be a hard road for her because seeing someone lose that belief? Both of my characters would have hard journeys because they were trying to save two worlds and that’s no easy task. However, Lil’s story had to be even more nuanced than Erik’s because of my lack of personal experience with that identity. I wanted to show the way she’s dismissed as so many women of color are, her intentions misconstrued, her protestations ignored. I wanted to show Lil’s strength, not some mythical black woman strength that meant she didn’t get hurt or could take more punishment because of her black womanhood, but the strength in knowing what she was doing was right. I had to show this without slipping into any of the tropes and horrors that follow the depictions of black women in our society. I didn’t want Lil’s story or pain to feel exotified of exploitative and the stories told and revered in our society encourage us to use women’s pain as window dressing, as something to spice up a tale. Luckily I have my friends to look to, all the black women in my life that counter this message simply by existing and telling their own stories. Once I had the ideas for both of these characters the rest of the story began to grow out from them. I didn’t have everything worked out yet but I knew that these two characters, all too rare in speculative fiction for being black and queer and three-dimensional, would be the center of the story I was telling. Then around these two ideas/characters developed another big idea like some delicious flaky crust. These two characters, these reactions to real life stereotypes could and would exist between the covers of an adventurous, fantasy story that was not solely focused on their identity. Maybe that’s why at first I didn’t think of these things as big ideas. First because it was born of all these smaller ideas coming together to form a story and secondly it’s what I’ve always wanted to write. For Lil and Erik, their pasts affect them and influence their decisions as with any good character, but their identities, the colors of their skin, their sexualities are not all that they are by any means. I wanted to see people like me and my friends concerned with surviving, with fighting bad guys, with saving the world, with falling in love, with living through an urban fantasy landscape that all too often didn’t look urban at all. I sometimes still hesitate to call that a Big Idea because it seems so obvious to me but from a lot of the reactions I’ve gotten – the anger AND the thankfulness it seems like it’s more of a big idea than I ever thought. Black Tide Rising and Mash Up — Out Today! This looks like a very interesting book so I’m gonna put it in the “books to buy” list. This sounds good. People’s preconceived notions about a person’s looks, sounds, etc. definitely do make a difference, and race and sexuality sure do, as do handicaps or anything at all that’s perceived as different. Absolutely, some people will ignore or look right through someone who doesn’t fit their notion of whom they want to accept. This can occur even if you are otherwise the majority, but some other factor makes you read to others as too different. And if it’s you or a loved one or a good friend, it really is a hurtful thing to see when other people not only treat someone badly but outright reject them or ignore them. I also know what it’s like when someone presumes that just because a person looks and sounds, on the surface, like part of the majority, he or she may still have ties, belong to or relate to, any of those minority groups. It can be a surprise for both parties when you run into that kind of assumption. It’s refreshing, but a difficult task, to represent that in realistic terms with characters who’d be from everyday life. I hope the book manages that really well. We need to see more of that, presented in a believable way. If you can believe the figures, my own city is around 1/8th black, 1/8th Hispanic, and what are likely under-reported percentages for Asians and others, with a white majority less than what’s reported, but still between half and 3/4 of the population. In other words, if you put my city in a book or TV show or film, you’d see a lot more not-so-white, not-so-straight, not-so-majority people there than are ever shown most times, and the white folks there wouldn’t all be necessarily only that majority culture, and not only in terms of race, but many other ways. When I was a kid, a teen, and a young adult, I rarely saw fictional characters who were quite like me, though I didn’t always notice that bakc then. I do notice it more now, and I wish all kinds of people were better represented, and shown as we really are. This sounds super cool, I’m in. Off to Amazon! This sounds like a great book! Snagged the free sample from Amazon to check out as soon as my Hugo reading is done. Ok, I’m sold. Adding this to my Books-to-Read List ASAP.